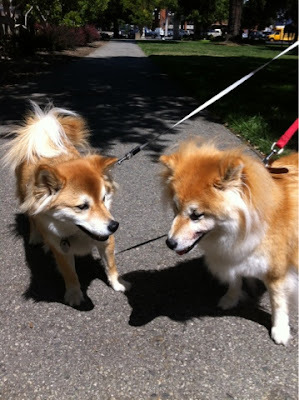 We met another Shiba Inu, Bella, today at the park. Not only she's another long-coat Shiba, she's only a few days younger than Maya. According to the lady who was walking Bella today, her daughter brings the pup here everyday as well. I guess we have very different schedule, so I've never met them before. This is actually my first time meeting a long-coat Shiba that's not related to Maya. Goodness.. with the coat, they both almost look alike!